At Sandy Cape and the surrounding area there are hundreds of kilometres of dreamy beaches with white sand dunes. Some of the world’s rarest marine species can be found in Coral Coast Australia just a few metres away from sandy beaches. 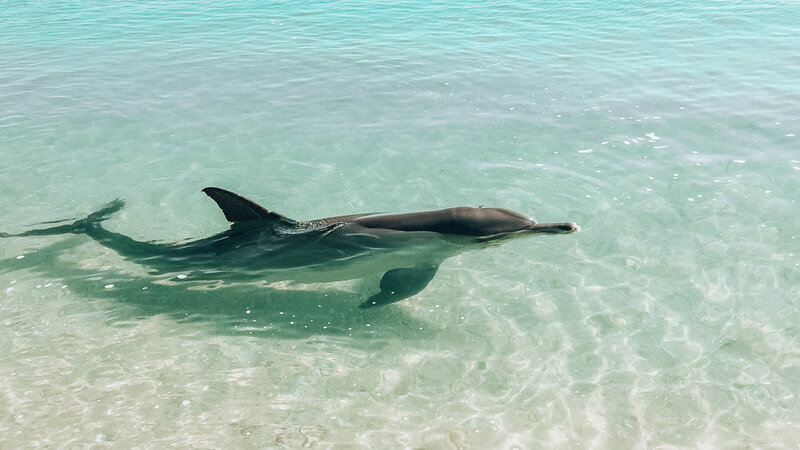 In Monkey Mia, get to know the dolphins up close or take a stroll through the Pinnacles Desert. During springtime and autumn, many tourists travel to Perth to see the beautiful landscapes and enjoy the temperate climate. The West Australian city of Perth is an attractive destination with three-quarters of the population living in this state. It boasts lush forests, vast canyons, and snow-white sand dunes in the desert, where you can take a walk and enjoy the amazing views. Tip: Download all the Western Australia maps to your smartphone as image so you can use them offline whenever you want. Perth is a great city with 1.8 million inhabitants. If you want to spend more time in Perth, we recommend that you extend your trip by one day and explore Perth. If you can't extend your trip, we recommend getting up early in the morning to discover as many sites as possible! The 4,000-acre Kings Park near Swan River is Perth's pride and joy. In this park there is a 17 hectare botanical garden, with more than 2000 different species of plants that you should definitely find out about. Our Western Australia tours start from here, but alternatively you can have breakfast in one of the great restaurants and then explore the city on foot. Later in the day, you should go to Fremantle and take the ferry from there to Rottnest Island. You can take the ferry from Perth, but the crossing will take much longer and then you can visit the prison in Fremantle. In Rottnest Island, there are between 8,000 - 10,000 Quokkas - this alone is enough reason to visit the island. On the return journey from Rottnest Island and arriving in Fremantle, we recommend that you visit the prison. Not too long after the prison visit, you should take a trip to Cervantes to visit the Pinnacles at sunrise. 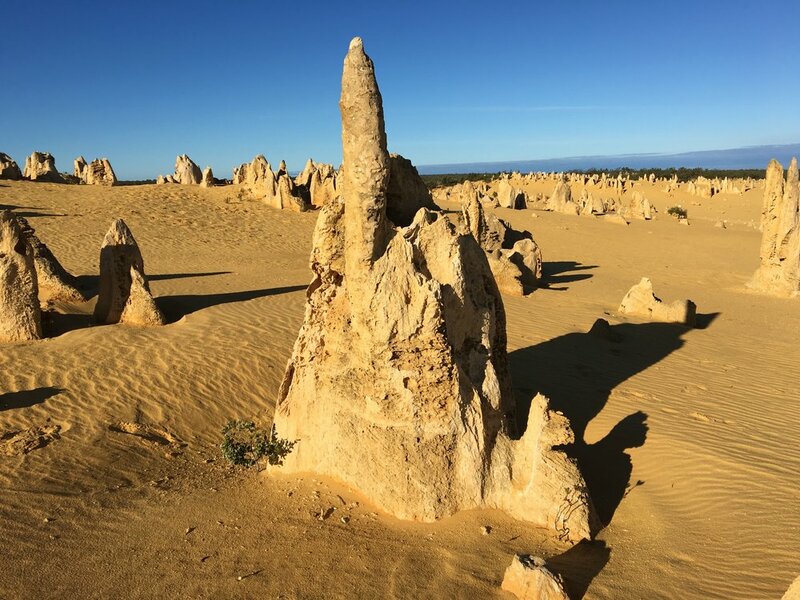 The day starts from sunrise in the Pinnacles, because this is the time that Pinnacles provides the most beautiful shade plus you'll get to enjoy this desert's views early in the morning. Afterwards, continue to Jurien Bay at Sandy Cape. There are unique, deserted, white sandy Western Australia beaches with dunes in the background. A short walk through the sand dunes feels like you are in the desert with just white sand for as far as the eye can see. 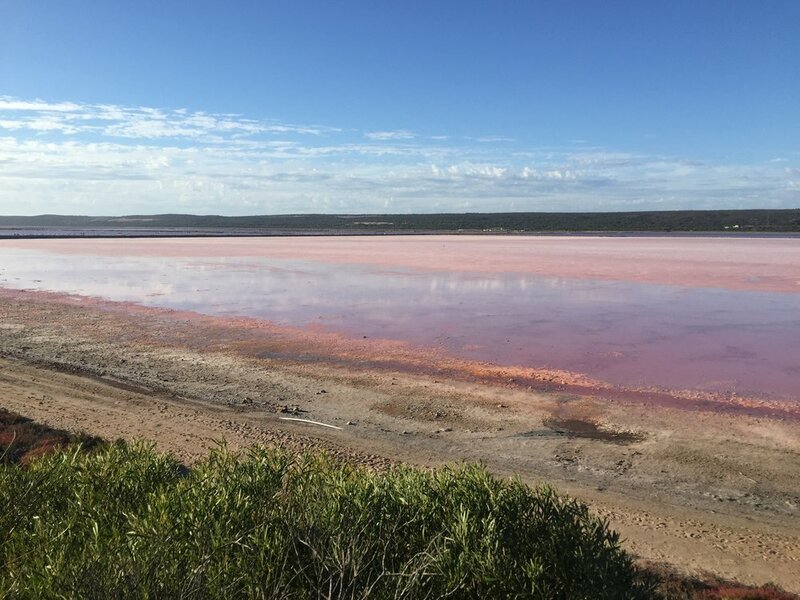 Gregory has a pink lake that you can see. However, you should arrive in Kalbarri National Park in the late afternoon to watch the sunset at the "Nature's Window". The Kalbarri National Park has some beautiful viewpoints and aside from "Nature's Window" the "Z-Bone" is especially worth seeing. If you keep your eyes open in the evening, you will not only meet plenty of kangaroos, but also echidnas (beak hedgehogs or ant-hedgehogs). After a leisurely breakfast, the day starts with pelican feeding, which takes place daily at 08:45. Unfortunately, there is only a 50% chance of seeing the pelicans. Here's our tip: If you're in a hurry, you can skip pelican feeding as dozens of them walk around the beach in Monkey Mia. 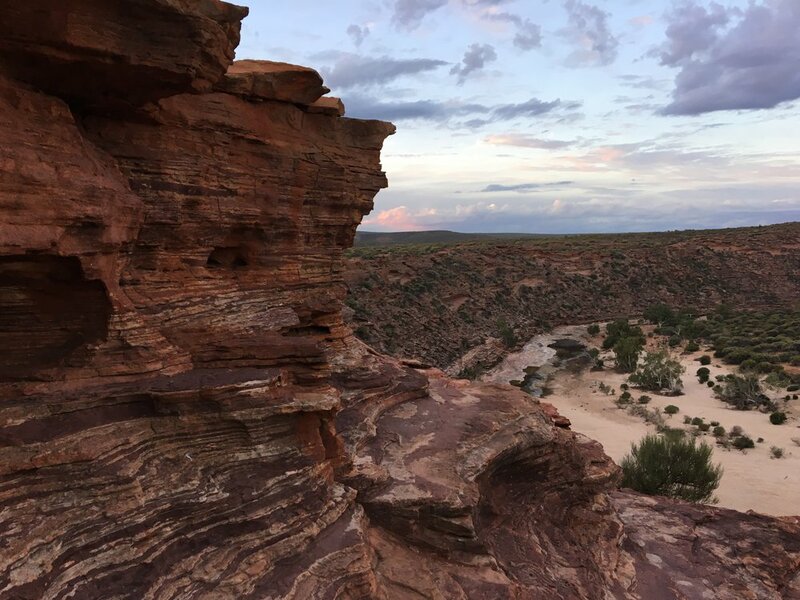 The next stop is one of the two viewpoints called Ross Graham and Hawks Head in the Kalbarri National Park. At both points you have a beautiful view of the canyon and the river. The difference is that the Ross Graham Lookout probably offers the easiest river access. Hawks Head, on the other hand, is also suitable for wheelchair users. After a last look into the Kalbarri National Park, the journey continues to Shark Bay with a total of xy kilometres to the stromatolites at Hamelin Pool. Shark Bay is known for its unique white sandy beaches with crystal clear waters surrounded by red sand dunes. In 1991 the region was incorporated as Australia's first World Heritage Site. 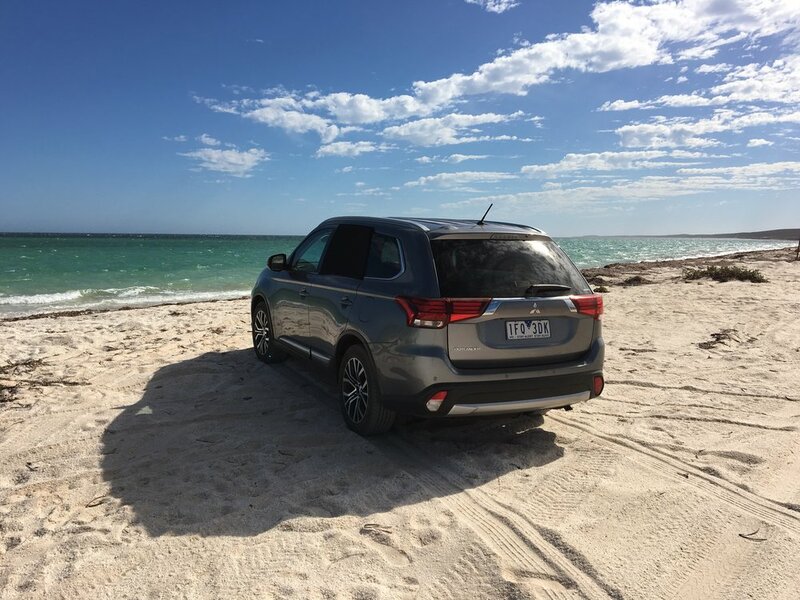 The World Heritage Drive is 155km long and runs through the entire area from Hamelin Pool to Monkey Mia and passes through all the attractions. Starting at the 3500-year-old stromatolites at Hamelin Pool, there is also a Telegraph Station and a small museum. Next we continue to Nanga Bay. There is a small cosy campervan park with beautiful, crystal clear waters at this bay. There is also a small emergency petrol station. 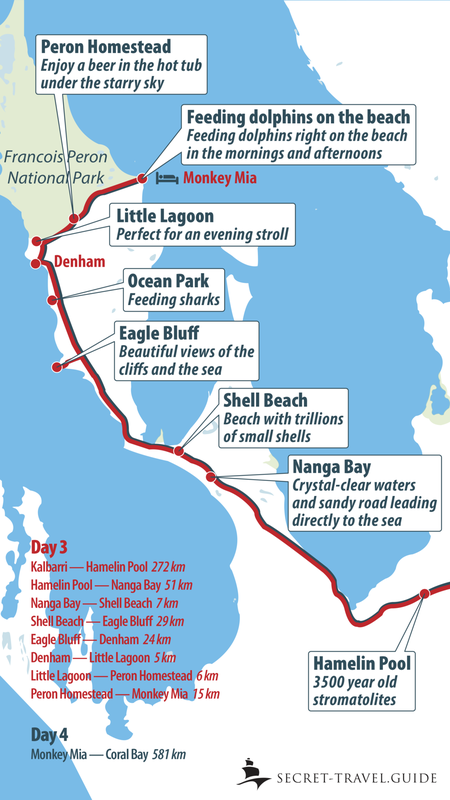 From Nanga Bay it's only 5km to Shell Beach - a beach with trillions of small shells. Ironically, a warning sign on this beach tells you not to remove the shells. A beautiful viewpoint over the cliffs and the sea can be found at Eagle Bluff, where you can also watch the passing sharks. We will leave out the Ocean Park for the time being, since tours are only offered until 3pm so it is advisable to visit the place on your return trip. After a short drive you will reach the largest town in Stark Bay called Denham. Denham is great for stocking up with a few supplies and filling up with fuel. As long as the sun has not set yet, we recommend that you drive 4km to the small lagoon just behind Denham. At the small lagoon we recommend an evening stroll during the sunset along the lagoon to the mouth of the sea. A tip from the locals: Buy a beer in Denham and enjoy the starry sky in the Hot Tub at Peron Homestead. Afterwards, drive to Monkey Mia as dolphin feeding starts early in the morning. I can highly recommend the RAC Monkey Mia Dolphin Resort the location is simply unbeatable. The best thing about this place is that you are right on the beach for dolphin feeding in the morning. My tip: stay here for 2 days, I very much regret not having spent more than one day in Monkey Mia. The beach is gorgeous, dolphins and rays are at your feet and the blue waters are amazing - Monkey Mia was my personal highlight of the whole Western Australia tour. The day can not start any better than watching dolphins dive right in front of your feet. The Dolphin Experience starts daily at 7:45 am, but it is repeated several times in the morning until noon. Meeting point is right on the beach and all the spectators stand in a row along the beach. The dolphins come daily almost without exception (supposedly 360 days a year). A couple of chosen participants are allowed to feed the dolphins with a fish. Our tip: Keep the morning free until around 10:30 am for the dolphins! First of all, less and less people come to the later sessions, and secondly, the dolphins become a little more friendly every time - this is a unique, memorable experience and a must when visiting Shark Bay. Afterwards you can join one of the many tours on offer, such as a manatee tour. But since manatees are vegetarians and only graze on sea plants, they mostly swim in deep waters and graze on the plants at the bottom of the sea. This means that they only come to the surface briefly for air so you cannot really see them properly or take photos of them. But you can still see dolphins on the boat tour. A visit to Pearl Farm is also a must. This farm has a license to breed black pearls. Our tip: If you have time, you can enjoy the boat tour, the morning visit on the beach with the dolphins, and go to Pearl Farm, but without taking a 3-hour boat trip. Pay attention to the time and visit the Ocean Park before 3pm as it would be closed by then. We recommend that you go earlier, because the animals are a bit slower and hungry later in the day. In Ocean Park you will find sharks (which are also fed), turtles, the nemo fish, rays and other types of fish from Shark Bay. You should not be late for the West Coast road trip to Coral Bay, because it takes at least 6 hours to get there. Be careful with your driving on the way as a lot of animals will be in the streets at dusk and even in the dark! On your Western Australia road trip do not forget to re-fill your fuel tank in Denham or Nanga Bay! In Coral Bay, you should definitely go on a snorkeling or diving tour and discover the underwater world of the Ningaloo Reef. On these tours you can see sharks, rays, turtles, nemos and other fish. Important: The early bird catches the worm! The interesting tours start in the morning around 9 o'clock; the best time to do what you want. There are 2 different types of snorkeling tours, both lasting around 2-3 hours. One takes place with a motorboat, the other with a "glass boat" (a boat with glass in the middle for passengers to look into the sea). In the afternoon you should make the West Coast trip to Exmouth. 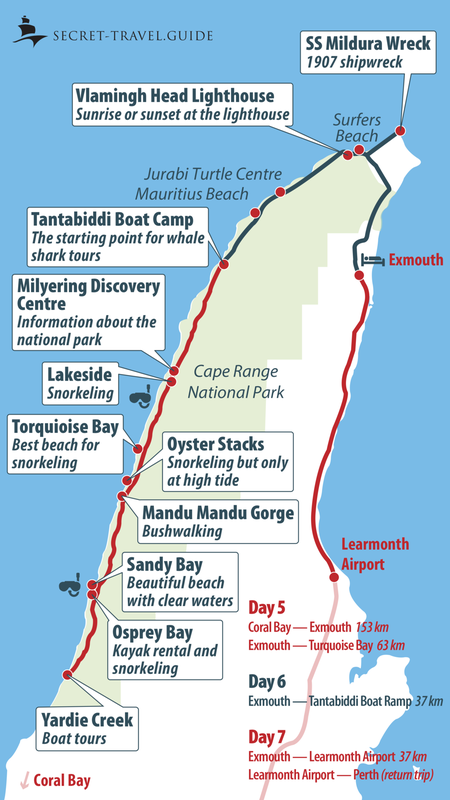 It is best to visit the tourist information office and book a whale shark tour for the next day. There are tour providers such as Sand on the Sea, usually offering whale shark tours and also help provide you with information. Tip: If you still have some time left in the day, you should definitely go snorkeling at Turquoise Bay. The reef starts right from the beach, so you can easily snorkel directly from there. 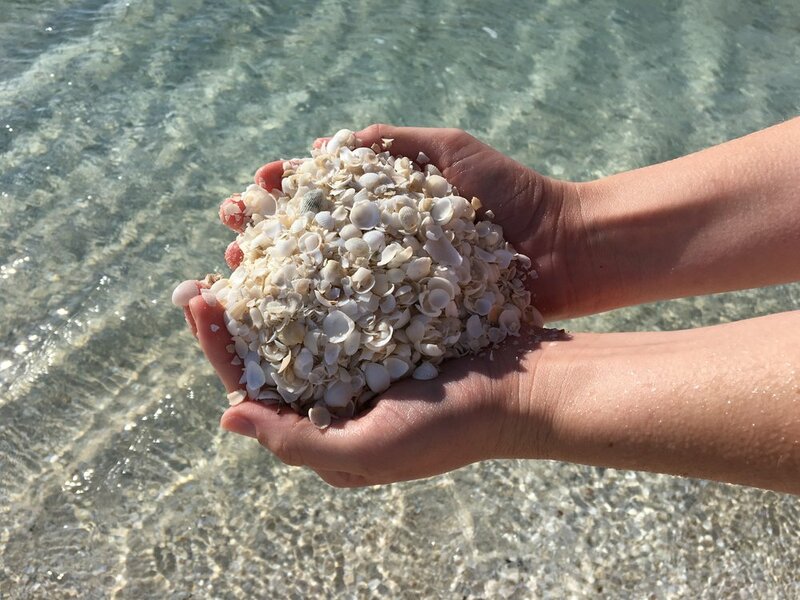 An alternative to snorkeling is Oyster Stacks, but here you can only snorkel at high tide because the water is very shallow and you will come across the coral. 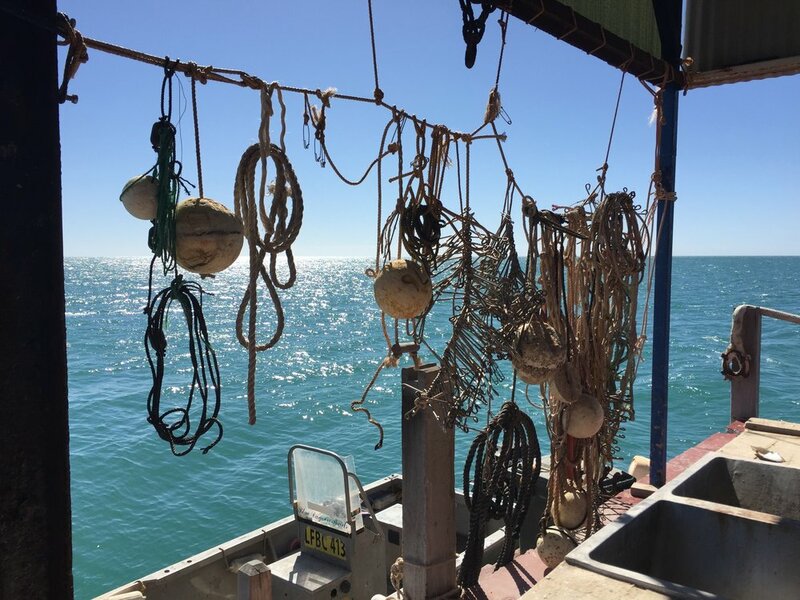 Alternatively, there are several other attractions to explore such as a shipwreck from 1907 or a Yardie Creek boat tour (see the map). In the evening you can comfortably watch the sunset from the lighthouse (Vlamingh Head Lighthouse). Kangaroos are also active at sunset and there are many in the Cape Range National Park. Just drive carefully through the streets and keep your eyes open. 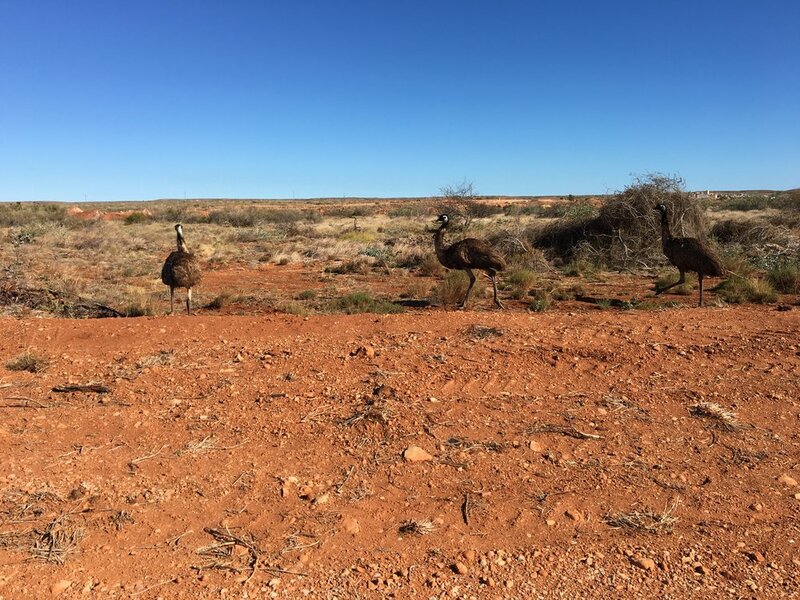 In addition to Kangaroos, many emus also run through the national park. Today, see the biggest fish in the sea - the whale shark. The tours start from Tantabiddi Boat Camp, but most providers also offer a pick-up service. We chose one of the many providers and were overall very satisfied (I believe they do not differ very much). Not only did they allow us to swim with the whale sharks twice, but afterwards we were able to book additional activities for a small extra charge. You can either dive, explore the coral reefs with an underwater scooter, or just snorkel on your own. The probability of seeing a whale shark is very high. Whale sharks swim very close to the water surface so a helicopter looks for them and then passes on their location to the various tour providers. Most West Australian tours end in the afternoon, which means you have some time left to explore the area afterwards. Return journey: If you want to return to Perth you can fly with Quantas airline from Learmonth Airport. In Australia, it is not uncommon to have no Internet connection. This is why you should download everything in good time (for example, our maps or the tours you want to take part in). Telstra is probably the most expensive telecommunications provider, but also the best when it comes to connection reliability. Google Maps are sometimes very inaccurate when traveling outside of major cities. For example, the town of Nanga Bay in Google Maps is shown 15km before its actual location. Also, the Pink Lake located in Google Maps is at a point where there is no actual lake. Tip: Take a look at our map instead or the maps in local brochures. The best thing to do in the evening is to drive long distances so that you can enjoy the day's highlights. Fill up your car with fuel at every petrol station, even if the tank is still half full - You might not see another petrol station for a long time. Looking for Western Australia animals? Kangaroos are especially active in the evening / at night! You will find them especially at night in common tourist places like parking lots because they are looking for food. What happens if the ranger catches you secretly camping in a prohibited place? It happened to us once, but we honestly did not see the sign. If you say sorry they won't be too strict with you. He let us get away with a warning because we were already awake. 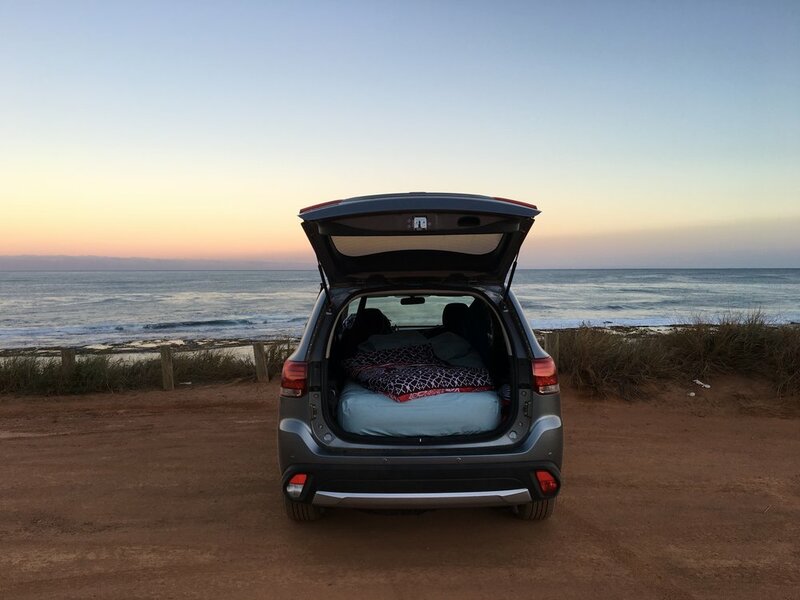 If you were sleeping in your own car, you can try the excuse that you thought camping wasn't allowed in tents but fine in the car. Can you actually enter the national parks when the opening hours are over? We always managed to get in and never saw anyone watching. It's probably not allowed because of the animals that become active at night like kangaroos. Unfortunately, many are run over so maybe you won't be allowed to go to the park after sunset or before sunrise. What time is it in Western Australia? What is the capital of Western Australia? The capital city is Perth and it is the largest in WA Australia. What is the population of Western Australia?